St Cuthbert’s High School is fitted with outdoor gym equipment to help its young people exercise and improve their health and wellbeing. 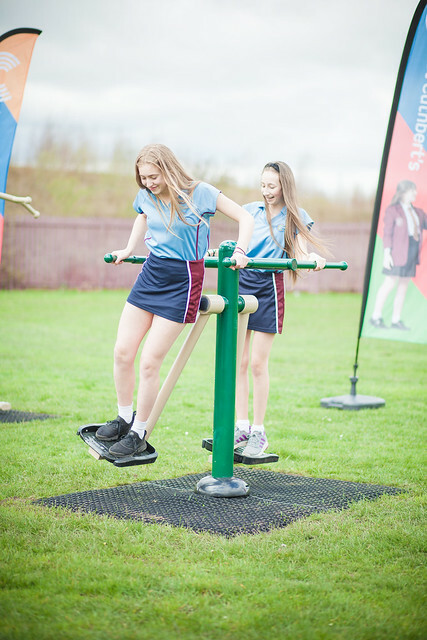 Following a successful application to the Healthy Pupils Capital Fund, St Cuthbert’s Catholic High in School in St Helens secured funding to install an outdoor gym. The school was keen for the students to have a facility that could be used by both its own students as well as those from its partner primary schools. The school specified a range of equipment that would be safe and beneficial to a wide range of ages and abilities. It includes 3 pieces of cardio equipment; the Air Skier, the Push-up and Dip Station and The Rider - all great for raising the heart rate, getting the whole body working, burning fat and toning the body. For strength building the gym also includes a Seated Leg Press, ideal for building muscle and tone along the whole legs and a Combination Pull Down and Chest Press, for building muscle and tone in the arms, back and chest. For flexibility and balance the gym includes Tai Chi Spinners. The Department for Education Healthy Pupils Capital Fund is intended to improve children’s and young people’s physical and mental health by improving and increasing availability to facilities for physical activity, healthy eating, mental health and wellbeing and medical conditions. Funding is provided from the Soft Drinks Industry Levy for 2018-19 only.